That is pretty awesome. 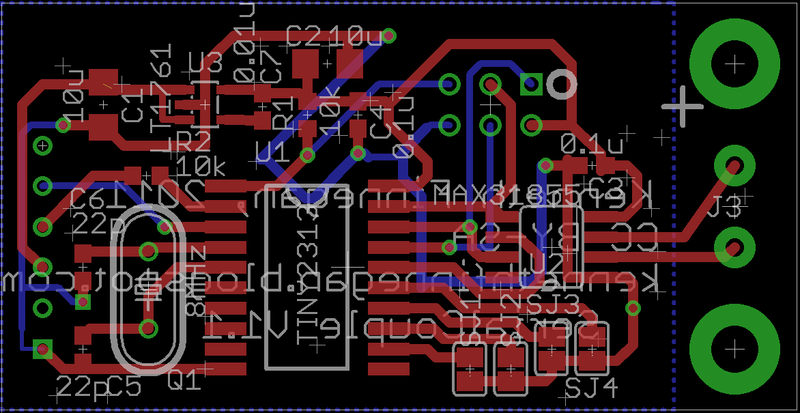 One of my goals for this summer is to design a PCB and have it made. Do it! The hardest thing I had to realize is that for your first project, maybe 75% of the time is going to be in making your custom parts library, because Eagle just won't have everything you need for your project. I then just made a 0misc.lbr library with all my favorite parts, so by the 5th board design, I can relatively crank it out. I would advise to watch Eagle tutorial videos from YouTube. I can not express how much time it saved me. It's like watching over someone's shoulder. Kenneth, you could save on crystal by using tiny861 - it has many pins which you probably need to interface with Maxim's chip and internal oscillator good enough to handle USB library. I did not try it myself, though. @Victor: I don't understand what you mean. I've got 5 left over IO pins, and the tiny861 is no bigger than the 2313. The Attiny861 has an internal PLL that can generate a 16MHz clock with no external parts. If you sync it up to the hosts's USB clock signal you can get a super accurate clock out of it. The *61 series is really cool. I've switched to it for everyplace that I used to use a 2313. Got it. I'll look into them for the next major revision if we decide to integrate the USB conversion to on-board, and for just in general, if they're really so great. Any chance you could release your 0misc.lbr file? It'd save me making the MAX31855 by hand. I've been looking at the *61 for some of my next projects since the 2313 is lacking an A/D. I'm just curious, why did you decide to go with the MAX31855 instead of something like an attiny85 with an internal ADC's? Because the MAX31855's are only $4 a piece, which is comparable to a chopper op-amp plus cold-junction reference in cost, with a lower part count. 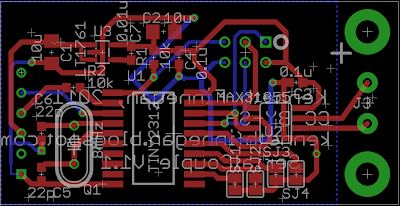 Also, having a single PCB with drop-in replacement for targeting any standard junction is an advantage compared to using something like an LT1025. I think I understand. How to get a reading from a thermocouple is completely new to me, just trying to figure how you did it and why. I'm thinking a variation on this could work well for controlling a diy reflow oven. Exactly. You could actually use this board itself to control a reflow oven, using the two serial pins as I/O instead of serial to a USB adapter. All you'd need to do is reflash the firmware and connect it to some way to switch the oven. Nice work. The other comments WrT cost/crystal or external sync etc are valid ones in some situations. From my understanding of SerialCouple's potential application environments, that crystal is a feature worth keeping and "cost" is relative to sanity etc. The vast majority of thermocouples in our daily lives are used for direct control or embedded into a device's main board. Being able to remote a conditioned thermal measurement over ordinary wiring is a Very Good Thing. I Was thinking of this for FDM 'bots too. Great work Kenneth. I have recently used one of the Omega branded units that you alluded to in an Industrial application. The 1 significant benefit that this very expensive option gave me is the Ethernet connectivity and web interface. We are able to incorporate the current temperature in to our PLC/SCADA system. @Granite: I'm having a plethora of difficulties as far as getting the Maxim ADCs to actually work as well as they claim they do. I've played with turning this board itself into a PID controller with an umbilical cord adapter to a battery pack and SSR that worked pretty well. Once I finally solve the last of the analog signal problems, I've got a variety of ideas as far as ISM wireless networks, RS-485, on-board logging flash, etc. 10bT Ethernet is possible, but I haven't worked on it long enough at any one time to get comfortable with it. Feel free to think out loud as far as where you'd want it to go. As it stands now, it would actually be possible to solder this directly to a WRT54GL wifi router and use that as a wifi or Ethernet bridge, but it'd look kind of hacky. Bit of a blast from the past post I know, but quick question: on downloading the schematic and board files from the Google Code repository and trying to open them in Eagle 6.20, both throw up an error saying "Not an Eagle File." Any ideas why that might be?? What about linearization? The datasheets alludes to having to linearize the temperature. I think this would mean using both temperatures (hot and cold junction) converting back to millivolts and going through the polynomials using floating point math. They perform first-order linearization on-chip, so if that's good enough, it's done. It's only if you want better than first order that you'd need to make more corrections in-software.